Diamond Cut Quality When jewelers judge the quality of a diamond cut, or "make", they often rate "Cut" as the most important of the "4 Cs." The way a diamond is cut is primarily dependent upon the original shape of the rough stone, location of the inclusions and flaws to be eliminated, the preservation of the weight, and the popularity of certain shapes. Don't confuse a diamond's "cut" with it's "shape". Shape refers only to the outward appearance of the diamond (Fig. 5 below), and not how it is faceted. The Importance of Cut Quality When a diamond has a high quality cut (ideal cut), incident light will enter the stone through the table and crown, traveling toward the pavilion where it reflects from one side to the other before bouncing back out of the diamond's table toward the observer's eye (see Fig. 1 below). This phenomenon is referred to as "light return" (Fig. 2 below) which affects a diamond's brightness, brilliance, and dispersion. Any light-leakage caused by poor symmetry and/or cut proportions (off-make) will adversely affect the quality of light return. 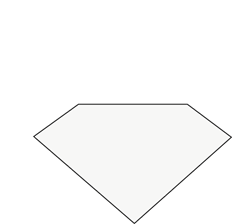 A) When a ray of light touches the surface of a diamond, part of the light is reflected back, this is external reflection. B) The rest of the ray penetrates the stone and is then reflected toward the center of the diamond. This is known as refraction. C) The ray of light is reflected to the surface, where it is seen as the colors of the spectrum. This is known as dispersion. Execution of the design, the precision of the cutting details and the quality of the polish are collectively called the finish.